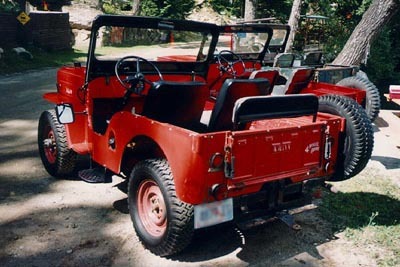 Steve Chabot (above) bought this 1959 Jeep in Maine in 1998 from the original owner, Wally Goldfarb, who had taken good care of it for nearly 40 years. As of November 2002 Steve has sold the Jeep to Mitch Woodward of North Carolina. 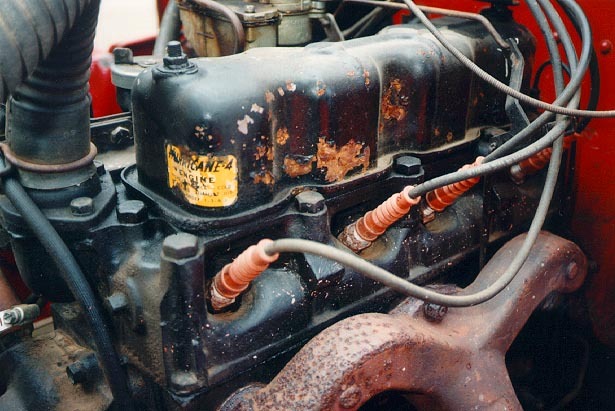 Steve commented, "The Jeep is in very good condition. What you see is the original paint -- it was garaged every winter and used in the summer as a camp vehicle on Webb Lake, Weld, Maine. It came with a 70's-era vinyl top. "When I first bought my Jeep I thought that I would go right through it with a frame up restoration but I have since changed my mind. The Jeep is in such good shape that I think I would be causing damage rather than making the Jeep better." Ron Murray's Jeeps are in the background of this photo. See also a great photo of the three Jeeps beside a lake (100K JPEG). 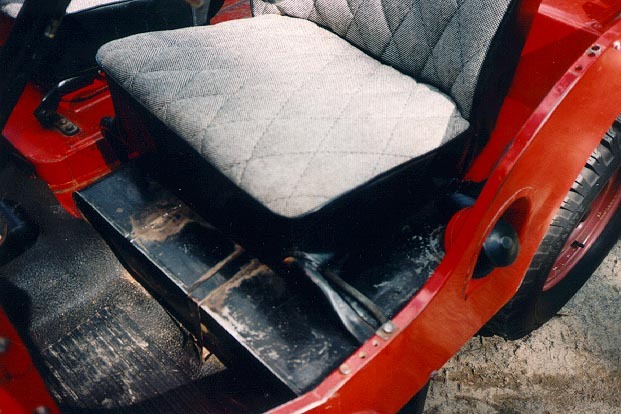 "The front seats were reupholstered (70K JPEG) with a fabric Wally said was similar to the original seat covers. The rear seat is a CJ-2A-style frame that I purchased from Walck's, with cushions from Beachwood Canvas. I also bought some seatbelts for front and rear -- I know that some people say that without a rollbar it is useless to have belts but I disagree. The way I drive this Jeep I don't think that there is much of a risk of a rollover, and my twenty-month-old would definitely go flying in a sudden stop without a seatbelt. See also closeup photos of the entry steps on the left side and the right side (100K JPEGs). "About all I have done to it besides the rear seat and seatbelts is wash, wax, and fluid changes. I did get somewhat of a scare when a fellow Jeep enthusiast told me about the oil reservoir for the front wheel bearings. 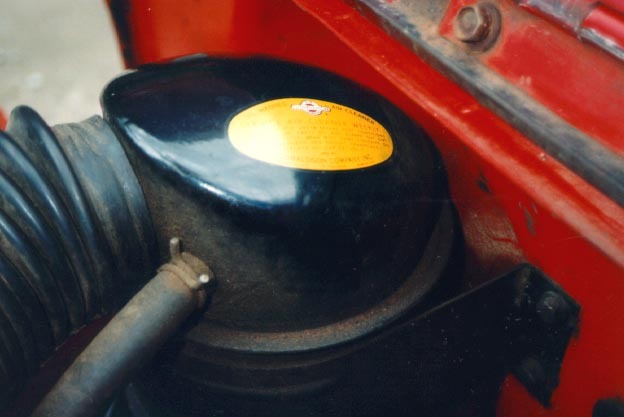 There is a plug on the back of the wheel bearing housing that you fill with 90 weight oil (I think it is 90 weight) -- mine was almost empty..."
This photo shows the original Hurricane engine label on the valve cover. 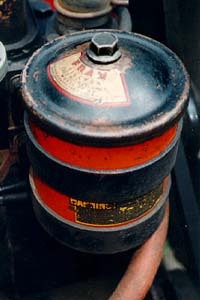 See also the original air cleaner label (30K JPEG) and oil filter label (15K JPEG). "My family and I love to go riding around in the 3B with top down on the back roads on those hot summer days. (You know those darn Sunday drivers I used to cuss about? Well now I am one.) We also take it to car shows -- I get quite a lot of offers to buy, but no trophies as of yet. The Jeep has been in the 4th of July Parade, all decked out in flags with my kids grinning from ear to ear (I of course had to keep a cool demeanor.)" "My family and I really enjoy our Jeeps (yes, Jeeps -- we also have a 1982 CJ-7 and a 1995 Grand Cherokee Laredo) and would not be without one. If you cannot find a CJ-3B don't despair because all Jeeps are fun. 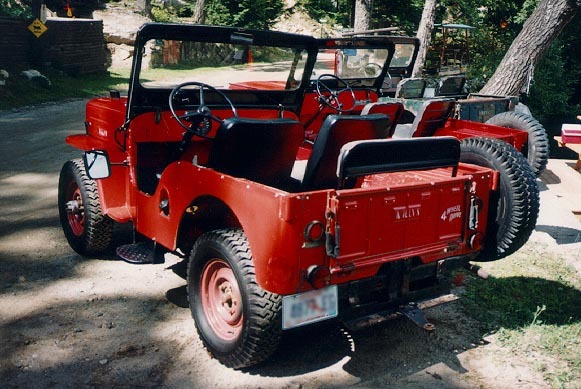 I am thinking about looking for a CJ-8 to gain more cargo room for camping." See also CJ-3B Meeting in Maine on CJ3B.info, for the story of how the photos above were taken. 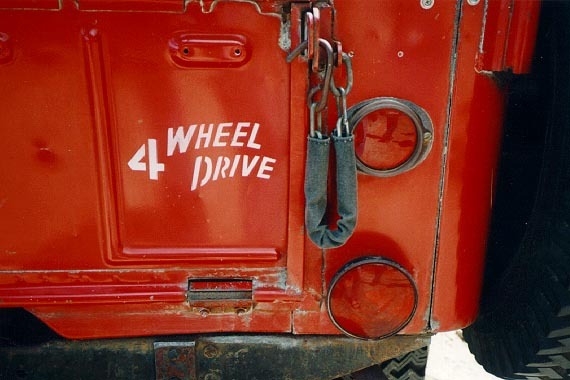 Return to Jeep CJ-3B Owners and Photos.